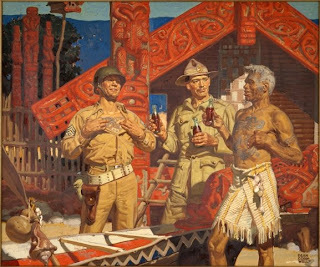 Several years ago I came across this 1945 Coca Cola Ad by Dean Cornwell in a little shop in Devonport, Auckland and had to have it. (Although, I ended up finding it much much cheaper at paperboynews.com). Besides having the American/New Zealand connection and the fact that it's a beautiful painting, I fell in love with the illustration because Coca Cola and Dean didn't do their research. Not only is the heading incorrect; it reads- Have a "Coke" = Kia Ora and below "kia ora", in brackets, it says "Good Luck". But, Kia Ora is a Maori greeting much like Aloha...just a "hello". The "Maori" in the illustration looks nothing like Maori, nor his dress nor his tattoos. His waka (canoe) looks nothing like a waka. The motifs on the "waka" are not Maori. The Meeting House is pretty spot on, though. And let's face it, the painting, as usual, is beautifully painted in the typical Dean Cornwell style.